Morocco is a vibrant country with extreme variety. It has windswept beaches, bustling cities, and jagged mountain peaks. Mount Toubkal, the highest peak in North Africa, is located in the Atlas Mountains and stands at an impressive 4,167 metres above sea level, making it a fine challenge for fit walkers. This trip combines a visit to Marrakech with a challenging hike in the Atlas mountains, where you will aim to reach the summit of Mount Toubkal. After arriving at Marrakech Airport, you’ll be shuttled to your riad for the first night. The following morning, you’ll drive towards the intimidating Atlas mountain range and begin your two day trek on Toubkal. You’ll spend the night at the Mouflon Refuge, 3,200m above sea level, before making a dawn start to reach the peak. After a quick celebration on the summit, you’ll make the long descent to the valley and drive back to your riad for a celebratory dinner. The next day can be spent exploring Marrakech before flying home. Sleeping well and being comfortable can make or break your trip, that's why we pride ourselves on delivering the best accommodation and service on and off the mountain. 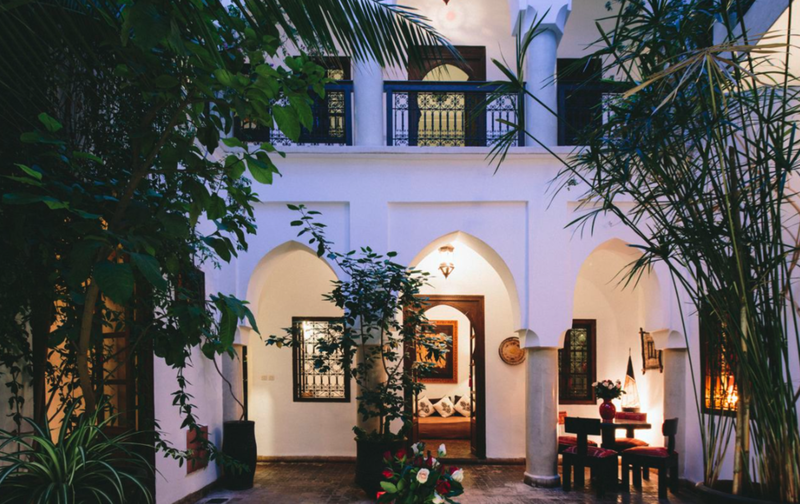 In Marrakech we work with a handful of beautiful riads for a truly Moroccan experience. Arrive Marrakech Airport and private transfer to you riad or hotel. Explore the famous Jemaa El Fna square by night when it comes alive with snake charmers, henna artists and traditional music. Departing from the riad after breakfast, you will begin your adventure with a 2 hour drive along the winding roads through Morocco’s gorges and valleys, to the Berber trailhead village of Imlil. After a quick refreshment of traditional mint tea, you will leave the vehicles and set out through the valleys and stark mountain slopes, admiring the remote villages and the impressive sight of the terraced houses perched on the mountains around you. You will break for lunch next to a waterfall in the sacred village of Sidi Chamharouch, before setting out again, up steep mule tracks to the Mouflon Refuge. You can use the rest of the day to relax or stroll around the surrounding slopes, before dinner and a good, if short, night’s sleep in the Refuge. Alpine start today for breakfast and set out at around 0500hrs towards the summit. The route starts with a rising traverse of a long slope, before narrowing to a broad gully. This first section will be climbed in darkness, and once the sun has risen you’ll get a view of your real objective, the summit of Jebel Toubkal, which will have so far been largely obscured by surrounding peaks. There is a further steep slope, before a final ridge climb and narrow path to the peak. The climb should take 3-4hrs and may be partly on snow. Once at the top, you’ll have time to take photos and a short break before starting your descent back to the refuge for lunch. After lunch, you’ll hike all the way back to Imlil, retracing your steps, and enjoying the thick air. Once back at Imlil you’ll drive back to your riad for a well deserved shower and good night’s sleep. Today will be a chance to recover and explore the fascinating sights of Marrakech, a vibrant and bustling city. We'll arrange a private tour guide to show you around, and explain the heritage of the medina and it's many historical buildings. If there's time, you can enjoy a leisurely lunch in town before departing for London. The best time to travel is between October and early May, when the temperature is cooler. The ascent of Toubkal is achievable for fit walkers with some determination. There are no technical sections, but the Guide has the final decision on whether a summit will be possible in case of bad weather, unfavourable conditions underfoot, or sickness. Summit day is around 10hrs in total, so although a full day, it is within the realms of possibility for most people with good basic fitness.